The Henry B. Plant Museum, in the heart of downtown Tampa, is designed to transport visitors back to the turn of the century. The ornate building is Moorish in design, featuring 13 silver minarets which is said to be a copy of the famed Alhambra Palace in Spain. 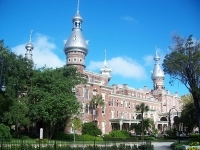 Railroad tycoon Henry Plant built the edifice in 1891 as the 511-roomed Tampa Bay Hotel. Today it houses period art and furnishings from Europe and the Orient, and details via exhibits the history of the resort and the early days of the tourist industry. Address: 401 W Kennedy Boulevard. Opening times: Tuesday to Saturday 10am-5pm, Sunday 12pm-5pm, Closed Monday. Admission: $10 adults, $5 children, other concessions available.